The husband and I took our first beach trip of the season on Saturday. I hadn't been to Rockaway Beach in years, but in the past few years I've heard some pretty great things about it. I must say, it's totally different then the time my close friends from High School and I were hanging out in the concession stand on the broadwalk and got caught in it being held up. That was a moment in life I'll never forget. But now from Beach 90 and north it's all hipsters and surfers. My favorites. It was pretty fantastic sitting out on the beach watching surfers in New York. 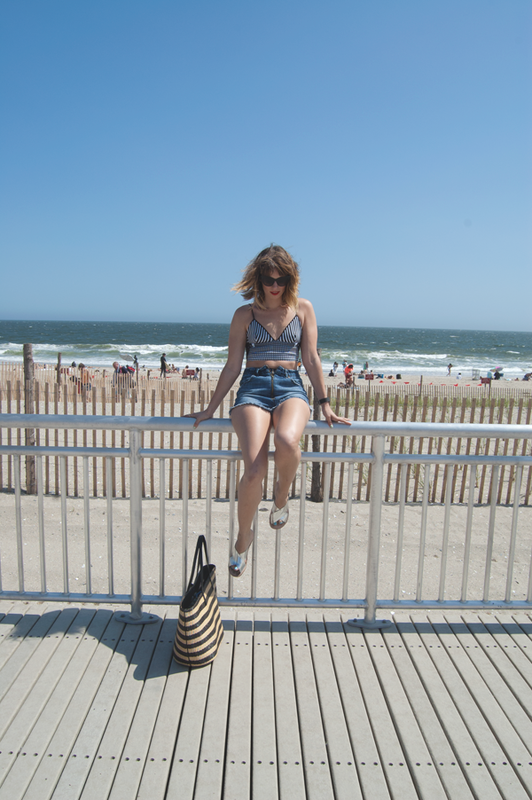 After sitting on the sand for a bit we decided to check out the Rockaway Surf Beach Club. Obsessed doesn't begin to explain how I feel about this place. Sitting out in the back patio enjoying a pina coloda and taking in the surfer vibe of the place totally transported me back to Hawaii. Man do I miss Hawaii. And man do I want to spend all of my summer weekends at the Rockaway Surf Beach Club. Sounds like you had a great time! I really really want to get to the beach soon. "do the Rockaway... now lean back... lean back" lol I have not been there. My friend and I are going to try to make it to Coney Island this summer which I've also never been to.